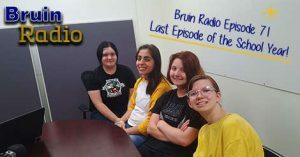 In this episode, we enjoy the return of BHHS alumnus Summer Olmos and Bruin Radio advisor Dane Tippman as hosts, with special guest host, BHHS counselor Michael Dunn! This game is between Chetco Pawn and the 101 Bar & Grill teams, and the final score is… a little rough! Give the show a listen and you’ll see what we mean! Photos by Dane Tippman. editing by Jessica and Dane Tippman. This episode is hosted by teacher Dane Tippman and BHHS alumni Nick Noland, and we’re calling plays for a game between the West Coast Organics team and the Chetco Trader pawn shop. You might also catch a few quick words from friend of the show Johnathan Kennedy, also a graduate of BHHS and former employee of our guidance department! You’ll hear a little vet-talk between Dane and Nick as well as we try to remember some Army terms. Don’t miss the exciting plays of these two great local teams at the Azalea Park ball fields! 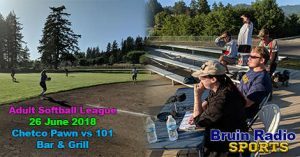 This episode is hosted by teacher Dane Tippman and BHHS alumni Summer Olmos, covering the opening game of the Brookings adult softball league players! 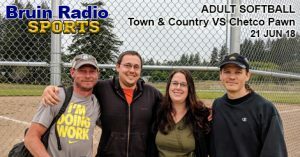 Our teams are the Town and Country Animal Clinic and the Chetco Trader pawn shop, but during the game, we call the Chetco Trader team the ‘streets, as they’re wearing street clothes and no team shirts. Enjoy our play-by-play of the game! 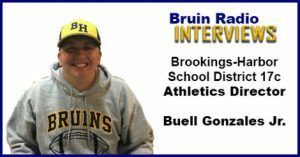 Bruin Radio Interviews: Buell Gonzales Jr.
Dane Tippman interviews Buell Gonzales Jr., who currently serves as the District Athletics Director, AMS Vice-Principal, and Head Boys Basketball Coach. 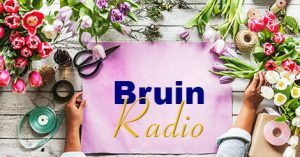 If you’re a student or staff member and you’d like to get involved, or if you’re a community member with input or advice for Bruin Radio, please reach out to us! E-mail Dane Tippman or Alex Merritt of the Brookings-Harbor High School. We would be thrilled to hear from you. .Student participation in this school-approved learning and creativity project is by the express permission of the students and their parents or guardians, and is conducted with the guidance of BHHS Vice-Principal Alex Merritt, BHHS Teacher Craig Cooper, BHHS Teacher Mr. Tippman and the approval of Brookings-Harbor High School Principal Lisa Dion. Names and pictures that may be included in this posting, and the names of students that may be mentioned in the show itself, were provided to Curry Coast Community Radio by the Brookings-Harbor School District with permission from the students and their parents or guardians in accordance with School Board Policy “JOB – Personally Identifiable Information” and the Brookings-Harbor High School form “Releasing Student Directory Information” signed by the parents or guardians. Isabella Freitas, Natalie Garcia, Iris Mitchell, Ashlee Ellis. Picture edited by Jessica Yock. This is the final episode of the 2017-2018 school year! 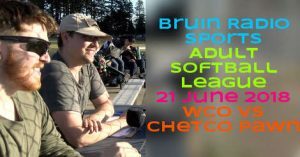 Many of our fantastic Bruin Radio students are graduating, or moving, and we do our best to bid them adieu. Bruin Radio wants to say a special thank you to Miles Wolfers, Angela Acosta, Logan Brown, Gage and Maclane Westbrook, Andrew Watling, Jadin Payne, Jeremy Pettinger, Brigid Mitchell, and Jed Doan! Thank you to each of you for the work and time you put into making Bruin Radio special. In addition to our happy and sad goodbyes, we share some interviews with Cast and Crew of the play Once Upon a Mattress by the Chetco Pelican Players. There are several important pieces of news in this episode, and you need to stay in the know! We update you on the status of the ACLU of Oregon settlement with North Bend High School, and the story encourages us to think about our own school. We also enjoy interviews with more cast and crewmembers of the upcoming play, Once Upon a Mattress!